WE'RE BACK!! Our online e-card service was lost in the server move (for whatever reason, the expensive script would not work on the new server) and its maker insisted we purchase the new version for about $200 as he would no longer support the older one. Unfortunately, that was not possible on my shoestring budget. 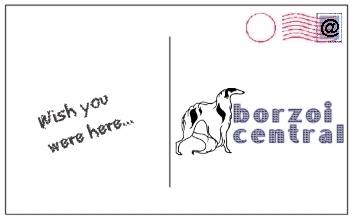 I finally found a wonderful script to handle e-cards for Borzoi Central that has almost all the bells-and-whistles of the former. I hope you enjoy using it! HAVE A CUTE PICTURE YOU'D LIKE TO SHARE? We're looking for more cute and entertaining or "artsy" pictures to feature in our Custom Image Collection for our online e-cards! We will feature a link back to you, and of course give you credit for your contribution. Thanks to those who allowed us to use their photos or artwork for our ECards! !